For families with children, school is starting tomorrow. I am thinking up easy yummy recipes for the busy pace. 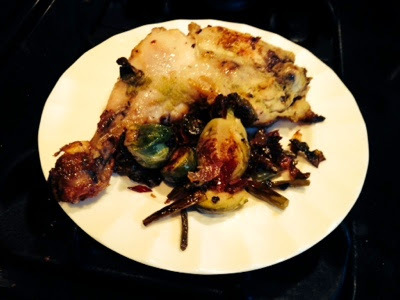 Here is my AIP low FODMAP chicken legs served with a side of pan fried brussel sprouts, garlic greens and pancetta. A squeeze of lemon juice adds a spark to this meal. Let marinade in fridge between 30 mins to 2 hours. Remove chicken out of bag and lay in ( raised ) oven tray - the ones that came with the oven. Turn oven to Broil and broil for 5 -10 mins to brown and crispy up skin.